As spring begins, this is a great time to take inventory of our homes and spruce up our living spaces. Not only does organizing help us find things more easily in our spaces, but it also has a de-cluttering effect on our minds as well. When we have a clear or organized space, we tend to think more clearly and perhaps enjoy the simplicity of holding on to less stuff. Let's take a look at a few areas we could potentially clean up and how to practically do it. Sort clothing by color/season/frequency of wearing, etc. Take inventory...when was the last time you wore that "hole-ly" pair of jeans? If it has been a year, then it's time to pass them on. Everything has its place in this small or big closet...use the space efficiently and use your own unique system. Know where everything is, so that you can easily navigate and see everything at a glimpse. Create ambiance. Make your bedroom serene and relaxing. You could use fragrant yet mellow candles or incense, a light dimmer or make it a no-screen zone. Keep the room at cool temperatures to help you sleep better. Invest in a comfortable mattress/bedding materials that will last long and help you get your best sleep. Consider installing hanging racks or built-in shelving units to store items, especially if you have a smaller garage. Sweep out the garage floor from all the winter weather remnants, like dirt, mud, salt, etc. Clean the interior and exterior of your vehicles--wash the car mats, vacuum the debris and crumbs and wipe down the seats and steering wheel. Visually appealing storage bins can make a big difference in a main room, especially if you have little ones that constantly play with toys in that area. It saves time to be able to throw those toys quickly into a pretty storage bin or basket rather than having to bring them in and out of a closet or just leave them sitting out on the floor. This also teaches kiddos to put their stuff back in the proper place when their finished. Check for expired items and discard. A plethora of bacteria reside in the drawers of your fridge; therefore, sanitize fridge shelves and drawers by cleaning with hot water and soap (preferably do this monthly or more). Keep items visible in the cupboards and fridge...if you can't see it, you will most likely forget that it's there. Alphabetize your spice rack or condiments in fridge. It may sound cheesy, but it saves time and helps you maintain order in the kitchen. Sanitize handles of fridge, microwave, dishwasher, etc. and use the self-cleaning feature on your oven. Whether it's a home or work office, create an organized desk space but include things that are characteristic of you, such as a picture of your family or pet, a favorite poster or inspiring quote. Consider using divided laundry bins to separate your darks from whites from delicates. Keep the washing machine clean and dry between cycles by leaving the door of the washing machine open so that it dries out and by scrubbing the inside lining to prevent mold and mildew buildup. Fold nicely or roll your shirts to see all your options in one glance (this also saves a lot of space). 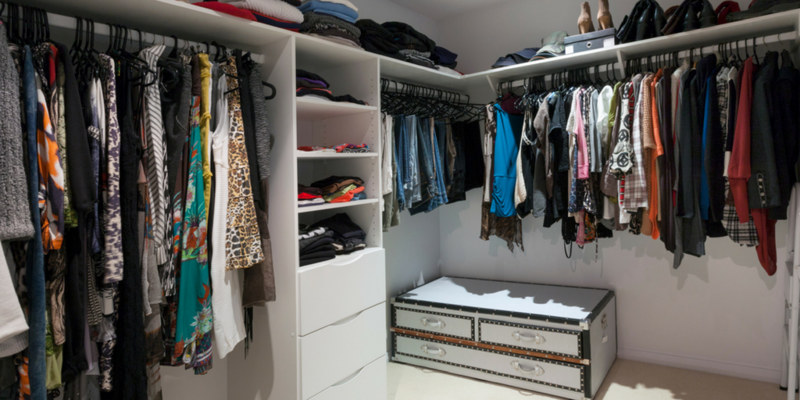 Just like your closet, take inventory of your clothes to see if it's time to give some items away. Try cleaning a little each week, so it's not too daunting or overwhelming. Make it enjoyable by playing music, getting others in the family to participate as a game or competition, or by using quality or nice-smelling products that leave your home smelling fresh and springy. Remember: Taking care of your environment (inside and outside) is part of taking care of yourself.